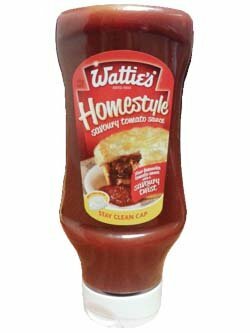 Wattie's® Homestyle Tomato Sauce is a delicious, savoury Tomato Sauce containing onion and tomato pieces. Available in a 560g bottle. Concentrated Tomatoes (68%), Sugar, Onion (6%), Food Acid (E260, E330), Salt, Spices, Mustard.